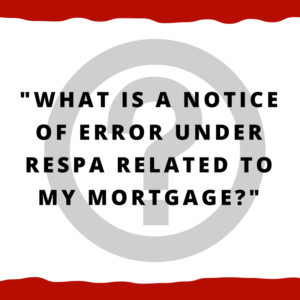 What is a Notice of Error under RESPA in the context of my mortgage? What is a notice of error under RESPA related to my mortgage? Basically anything that you’re dealing with your mortgage company on. If they have made an error, you can give them this Notice of Error and that gives them a chance to fix their mistake, to fix the problem. What are some rules about a Notice of Error? Then they go to the second letter, then the third letter, etc. That would be a second error. Then they report it on your credit report, you could dispute that through this vehicle of a Notice of Error. On the monthly mailing statement, usually they’ll say, “A qualified written request”, which is the old fashioned version of a Notice of Error or Request for Information and the monthly mortgage statement may also directly say Notice of Error or Request for Information. It will give you that address or you go to their website, or you call them and ask them what their address is. If they don’t have a special address for this then you can send this to the normal address, but most mortgage companies have a specific address. You have to send it certified so you can prove delivery. You can do it overnight, you can do it all different ways, but the bottom line is you have to be able to prove that your letter, not only was mailed, but that it was received. Well, you can’t. You need to do it certified, overnight, however you want to do it so you can prove delivery. What we recommend is doing it certified mail. Costs you about $7 per letter and that way they have to sign the green card and you know that they received that letter. What happens when they get that letter? That’s fine. Then they have 30 business days from receipt of the letter to correct the error or to say, “Hey look, we examined this. We took a look at it, there’s nothing we did wrong. We’re not changing a thing.” They have to do one of those. Either fix it or tell you they’re not going to fix it. What happens if they violate this law? Maybe they don’t investigate or they do such a lousy investigation when it’s obvious that they should have fixed the error. Then you can get actual damages. We also call these compensatory damages because they are to compensate you. It could be that because of this error you’ve been hit with a bunch of late fees, or maybe they’ve started foreclosure, maybe they’ve taken your house illegally. You could have a massive amount of economic damages. You can also get mental anguish. Obviously the stress of somebody taking your house or threatening to take your house is incredible. You can also get statutory damages and this can be up to $2000 per violation. Take our example of 10 errors. You send them those 10 letters they refuse to acknowledge them. They refuse to fix the problem. Well, that may be 10-20 violations. That could be $20-40,000 just in statutory damages. Then we can talk about what are the actual damages. Very, very powerful law here. Not always, but a lot of times, at least the smart companies, when they realize “Okay, we did some bad stuff and we got caught. Let’s get this settled in a fair way so that we don’t have to pay our lawyers a bunch of fees and the consumers’ lawyers a bunch of fees.” Very powerful motivator for them. Remember there are other laws that can apply. Usually if we’re doing Notice of Error we’re also doing a Request for Information, which is saying, “Give us some information.” You may have the FDCPA, Fair Debt Collection Practices Act that can apply to your mortgage company. That’s a very powerful law. There’s false credit reporting and maybe the FCRA, Fair Credit Reporting Act. There’s any number of laws that may apply. We don’t want to just be fixated just on RESPA. However, RESPA is a very powerful law and has recently changed to make it a lot more powerful than it used to be. Call us at 205-879-2447 if you have any questions. If you have questions that concern specifically concerns you or a potential case you have, you can contact us directly. Again, my name is John Watts, 205-879-2447, or you can fill out a form to get in touch with us. You’re also welcome to like the video, to share the video, Twitter, Facebook, however, you want to share it. If there is anything we can do to help us, feel free to give us a call, again, 205-879-2447. We represent people all over the state of Alabama. If you have other questions you would like us to cover, feel free to send them to us. We get the ideas for these videos from your questions. You can either reach out to us privately or you could put in the comments. We’d be happy to add you to our list. We’ll keep going through these questions. Hopefully, you have found this useful. Thanks for watching the video and I will talk to you soon. Thanks. Bye-bye.